Valiant Comics has been growing with every new year, and 2017 has the publisher significantly expanding the cosmic corner of its superhero universe. Writer Matt Kindt is leading Valiant’s charge into the unknown with his current X-O Manowar series, and in October, he’s reuniting with his Divinity collaborators, artist Trevor Hairsine, inker Ryan Winn, and colorist David Baron to venture to a new plane of existence in the Eternity miniseries. 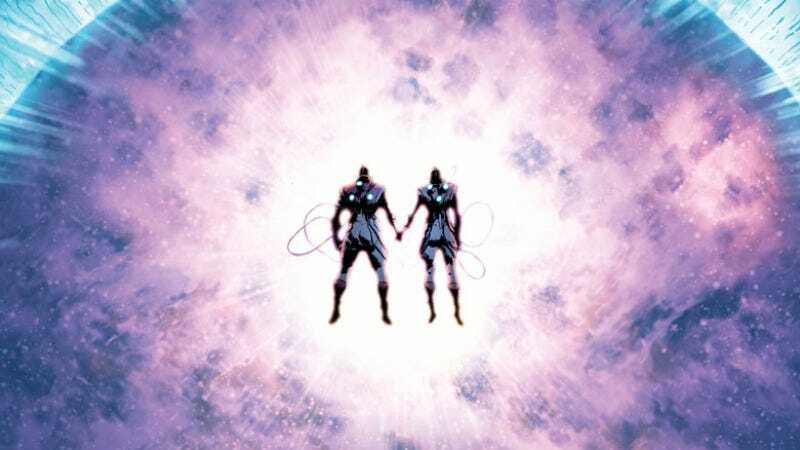 The first Divinity miniseries offered a glimpse of “The Unknown,” an anomaly in space that gave three Soviet Cosmonauts incredible superpowers, and Eternity reveals that “The Unknown” is a portal into another universe populated by beings that essentially function as Valiant’s versions of Jack Kirby’s New Gods. Eternity is a multi-dimensional epic that introduces a slew of new characters to the Valiant Universe, while giving Kindt and Hairsine the opportunity to channel the energy and imagination of Kirby’s work. Having the chance to really let loose is the thing that most excites Hairsine about working on this project, and readers can expect to see the artist embrace Kirby’s bombastic storytelling techniques in the artwork. This creative team has developed a strong rapport on the past three Divinity miniseries, and Eternity presents a new challenge as they build an alien universe from the ground up. Kindt, a successful cartoonist himself, is contributing many of the character designs, working with Hairsine and other Valiant artists to create characters that are visually compelling. Bright, fun colors, varying shapes and sizes, and a sense of mystery are the defining principles of these designs, and the images below show how different these alien characters are compared to the human heroes of Earth. “The look of these characters needs to tell its own story,” says Kindt. “I love character design—to me there’s no line drawn between the design of a character and the story and writing. It all goes hand in hand. The way a character looks can often drive the story as much as the story dictates what a character looks like. When you look at the population of this cosmic world—you should be dying to know what the backstory is on each of these characters.” Readers can discover the backstory of characters like Evoleven, Hallow, and The Spine King when Eternity #1 goes on sale in October, but in the meantime, Valiant has provided The A.V. Club with a first look at 12 of the designs for the cast of gods below.